If you need to get from San Diego to San Francisco - or from San Francisco to San Diego, you can get there by almost any common form of transportation. This guide can help you pick the best way to make your trip. California freeways offer so many choices for traveling between San Diego and Los Angeles that it could take you as long to plot your route as it would to drive it. I've made this trip many times and can help you narrow down the options to just a couple. If you're trying to make this long drive from San Diego in a single day, you need to get to LA as quickly as you can. Most online mapping sites will route you through Los Angeles on Interstate Highway 5, but in my experience, that freeway can be more than frustratingly jammed up, adding more than an hour to your trip, even when it isn't rush hour. Instead, try this route: take Interstate Highway 15 north from San Diego, then use Interstate Highway 210 west to connect back to the I-5 north, avoiding the busiest areas. Traffic jams can happen anytime on any road, so it's best to check the current traffic situation before you set out to be sure it's the optimum route at that time. If you don't have a mobile device that provides traffic info, Los Angeles radio station KNX 1070 has frequent traffic updates. After you connect with I-5, you'll drive north on it for about 280 miles, then take Interstate Highway 580 and Interstate Highway 80 west to San Francisco, crossing the San Francisco Bay Bridge (which charges a toll). If you're going south from San Francisco to San Diego, the same directions work in reverse. Going north, use the tips for driving from San Diego to Los Angeles to get started. Depending on traffic, you'll be on the north side of LA in two to three hours. From Los Angeles, check all the options for driving from Los Angeles to San Francisco. If you choose the U.S. Highway 101 route, try San Luis Obispo, Paso Robles or Pismo Beach for an overnight stop. They're about halfway between San Diego and San Francisco. Continue to this guide to find out more about that route. If you plan to follow the coastal route along CA Highway 1, Morro Bay and Cambria are good stops, just a little further north - which will allow more time for a leisurely coastal drive the next day. This guide starts in San Luis Obispo and takes you up the coast to San Francisco. If you're going south, you can use the guides linked above in the reverse direction, then use the tips for driving between San Diego and Los Angeles. Travel Time: Flight time between San Diego to San Francisco is approximately 1.5 hours. Even when you add a couple of hours for check-in and baggage claim, it's the fastest way to travel between the two cities. Southwest Airlines is a popular option for this trip, with no baggage fee and no change fees. You'll get the lowest rates from them if you reserve at least a couple of weeks ahead of time, but you'll have to go to their website to do it - they don't participate in other websites' fare searches. For all other airlines, you can compare airfares using Tripadvisor. The three-letter code for the San Diego airport is SAN, and San Francisco is SFO. SFO isn't the only San Francisco airport. You can also fly to nearby Oakland or San Jose. Check the other San Francisco area airports and find out their pros and cons. Buses and trains can connect you from San Diego to San Francisco, although they're much slower than flying (which is summarized on the previous page). They'll take about 50% longer than driving by the fastest route. Greyhound buses run from San Diego to Los Angeles. Expect many stops along the way, each one lasting 10 minutes to an hour. The fastest time is slightly more than 11 hours, and fares are somewhat less than flying. Once you get to Los Angeles, you'll have more options, including a couple of luxury buses. They're described here. If you want to make the entire trip by bus, check for options at GotoBus.com. The high-speed rail system you may have heard about between San Diego and San Francisco is unlikely to ever happen, according to California Governor Gavin Newsom who said in his 2019 State of the Address “Right now there simply isn’t a path to get from Sacramento to San Diego—let alone from San Francisco to LA," but you can make trip on an Amtrak train. The Amtrak Pacific Surfliner goes from San Diego's Santa Fe Depot through Los Angeles and north. But it doesn't go all the way into the city of San Francisco. Instead, the trains go to Oakland, which is across the bay from San Francisco. If you choose this route, Amtrak will take you from Oakland to San Francisco in a bus. A more convenient option might be to get off Amtrak at the downtown San Jose station, where you can catch CalTrain which goes directly to San Francisco. 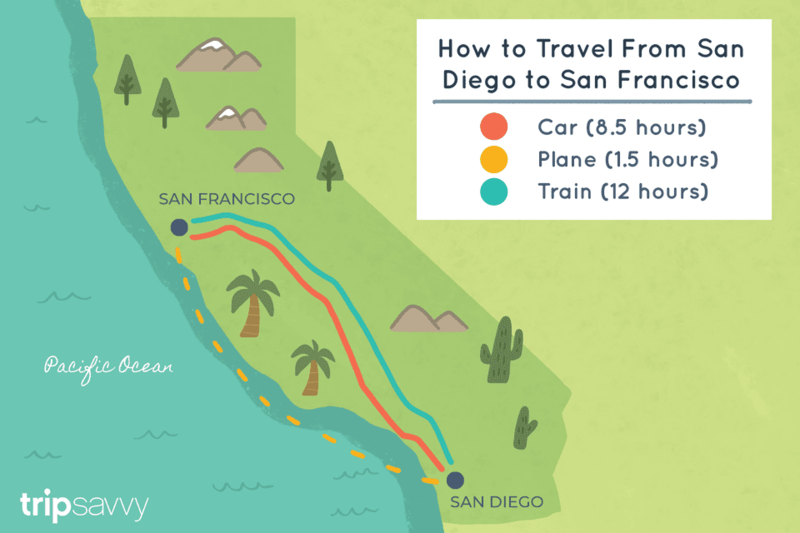 It takes slightly more than 12 hours by train to get from San Diego to San Francisco, and it costs about the same as a bus.